AnyNet 3G-EA Click is a cellular to AWS gateway device, which provides developers with the complete solution for various IoT applications, by using the AWS IoT and Cloud Storage services for the data storage, analyzing and processing. 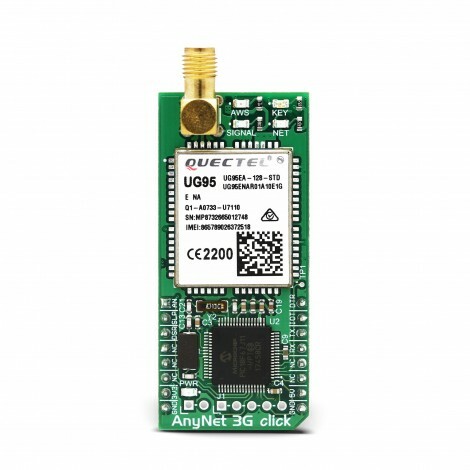 AnyNet click board™ provides a secure connection with the AWS over the air (OTA), by utilizing the Quectel UG95-EA 3G module, offering worldwide UMTS/HSPA and GSM/GPRS/EDGE coverage Eseye ES4623 embedded SIM card, that can work with more than 235 cellular operators from all over the world. An Eseye embedded sim card can work with more than 235 cellular operators from all over the world. The AnyNet 3G click can be used as an AWS IoT button with almost no configuration. AnyNet 3G click comes supplied with the start-up package - free activation through the AWS, unique ID number of the embedded SIM card and six-month cellular connectivity services of up to 5000 messages to the AWS cloud. With the AnyNet 3G click, users get the unique level of integration with the AWS IoT services. Note: Before the purchase of AnyNet 3G click, please contact Eseye and check for the coverage and support of embedded SIM cards from your local provider. Opening an AWS account and subscribing to Eseye marketplace is mandatory to work with this click board. The antenna is sold separately. The Click board™ comes supplied with the start-up package - free activation through the AWS, unique ID number of the embedded sim card and a six-month cellular connectivity services of up to 5000 messages to the AWS cloud. With the AnyNet 3G click board™, users get the unique level of integration with the AWS IoT services. 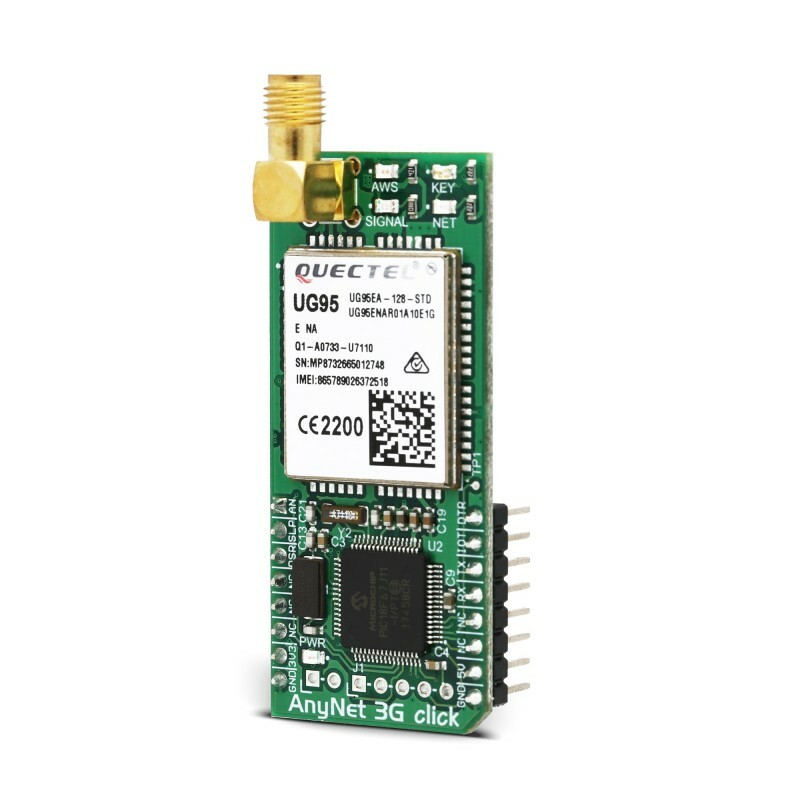 The cellular connection is established through the Quectel UG95-EA 3G module, qualified to work at European and Australian UTMS frequency bands, as well as with the GSM (2G) frequency bands available worldwide, and the embedded sim card by Eseye company used to communicate with the AWS. 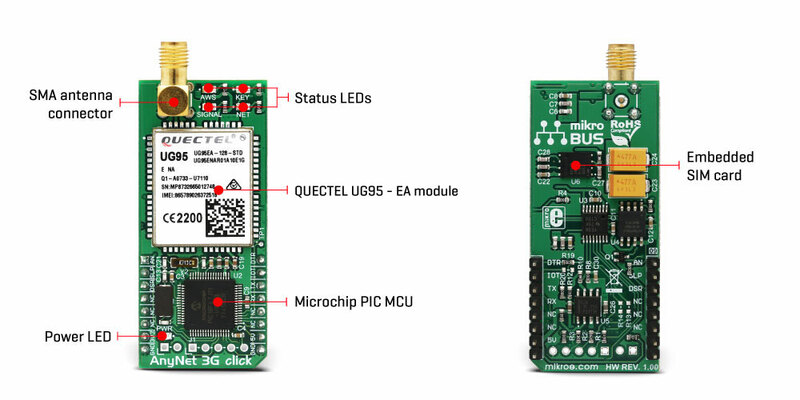 The additional onboard Microchip MCU contains the firmware used to interface the GSM/GPRS module to UART, providing users with easy to use end-point AT commands. UART communication speed is set to 9600 bps. To initiate the communication, several simple AT command strings should be transmitted to the UART pins of the click board. All the information about how to use AT commands can be found in the AT commands reference. AnyNet 3G click requires both 3.3V and 5V power supply pins from the mikroBUS™ to operate. The 5V rail is used to power up the Quectel UG95 module itself through the LVD regulator, while the 3.3V rail is used for powering up the rest of the circuitry. There are four LEDs used to display the connection status. Before the connection and communication with the AWS is possible, the setup procedure must be followed. For detailed step by step information, refer to the setup manual. After the successful connection to the AWS and successful exchange of the certificates, the serial interface can be used to publish messages on the AWS IoT service console. AWS also provides data analysis and processing, as well as cloud storage capabilities. 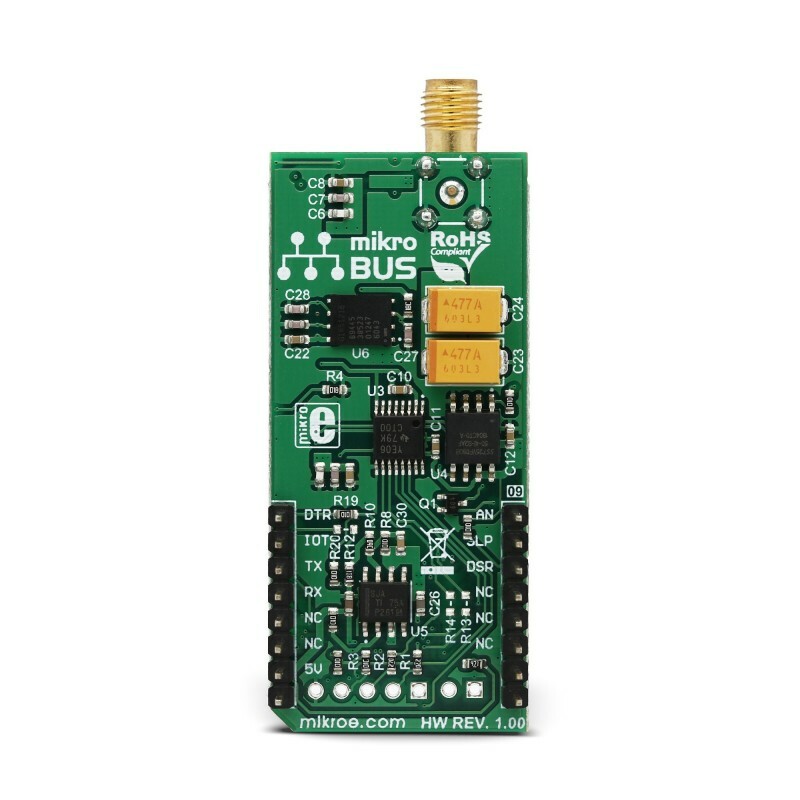 The click board™ has the IoT Button feature - a pin routed to the INT pin of the mikroBUS™ Setting this pin to a HIGH logic level is considered as IoT Button press. AWS IoT gateway recognizes three types of messages: short press, long press anddouble click. The AWS IoT Button pin is based on the Amazon Dash Button hardware. The functionality of this pin is designed for developers to get started with AWS IoT, AWS Lambda, Amazon DynamoDB, Amazon SNS, and many other Amazon Web Services. IoT Button pin can be coded in cloud service to perform various tasks, such as remote control for Netflix, a switch for Philips Hue light bulb, a check-in/check-out device for Airbnb guests and so on. It can also be integrated with the third-party APIs like Twitter, Facebook, Twilio, Slack or even custom applications. Future firmware updates are provided by the Eseye company over the air. The updates may include additional functionality and improved stability. For any additional technical questions regarding the firmware on this module, contact Eseye technical support. Connects development projects globally through 235+ cellular networks across 75+ countries and securely sends data to the AWS account. Supplied with a start-up package, including FREE Activation through AWS and a six-month cellular connectivity service of up to 5,000 messages onto the AWS Cloud. Provides security features for developers to remotely and securely activate, authenticate and certify the prototype device Over-the-Air directly from the AWS Cloud. Instantly meets Cloud security rules and gives immediate scalability as projects grow. Gives unique levels of integration with AWS IoT and reduces or removes ongoing developer and infrastructure costs with AWS resources e.g. AWS IoT Gateway and Cloud Storage and Analytics. Bills data sent from the device (Thing) to the AWS Cloud as messaging through AWS Marketplace. Use this link to find out how to sign up for the AnyNet Secure Cellular Connectivity through AWS Marketplace. To create an AWS account you'll also need instructions. Use this pdf manual to learn how to create your AWS AnyNet Secure Connected Thing. Applications The main purpose of this Click board™ is to provide a secure and reliable connection with the AWS cloud computing services. This table shows how the pinout on AnyNet 3G click corresponds to the pinout on the mikroBUS™ socket (the latter shown in the two middle columns). Note: AN, SLP, DSR and DTR pins are currently not supported in the click firmware and are intended for future development. For additional questions, please contact Eseye support. PWR Power LED - Power indication LED. Lights green when the power supply is established properly. NET NET LED - Flashing red – The module is attempting to connect to the network and Service. SIGNAL Signal LED - Solid blue – The module has registered on the GSM network. KEY KEY LED - Solid orange – The AnyNet Secure SIM card has received the Certificate and other security material from AWS. AWS AWS LED - Solid green – The module has established an end to end connection into the AWS IoT Platform. 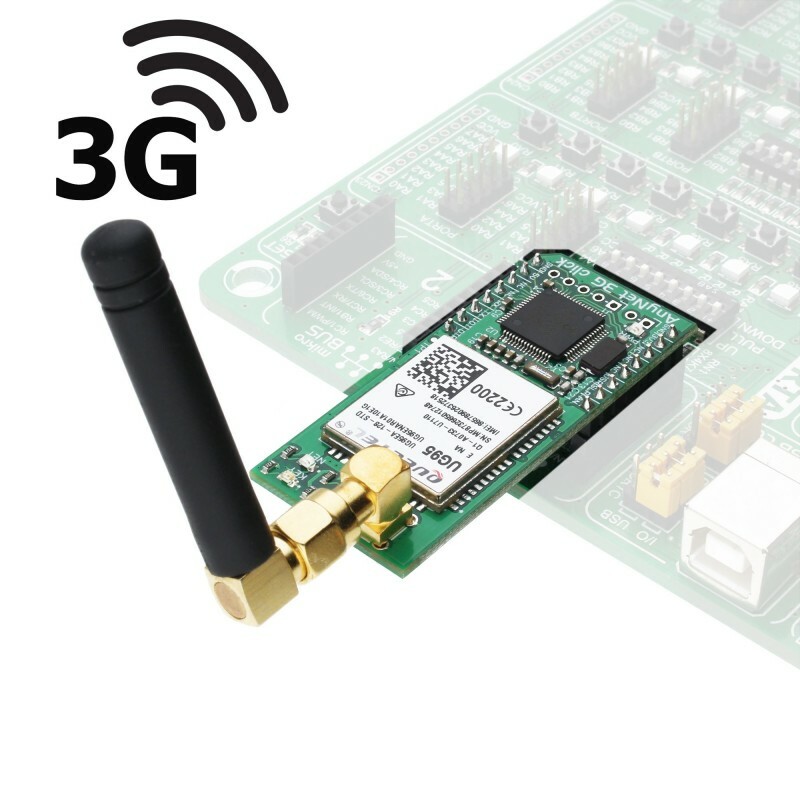 We provide a library for the AnyNet 3G Click on our LibStock page, as well as a demo application (example), developed using MikroElektronika compilers. The demo can run on all the main MikroElektronika development boards.